The other week, we reported that Samsung is planning to release the refurbished version of the Galaxy Note 7 in emerging markets such as the India, Vietnam, South Korea, etc. Now, an image has surfaced online in Vietnam, where the company even has a manufacturing plant to make the devices. The leaked image confirms some details regarding the phone. The Samsung Galaxy Note 7 released earlier came out with the model number SM-N930 (USA), SM-N930G (India), and SM-N930F (Europe). 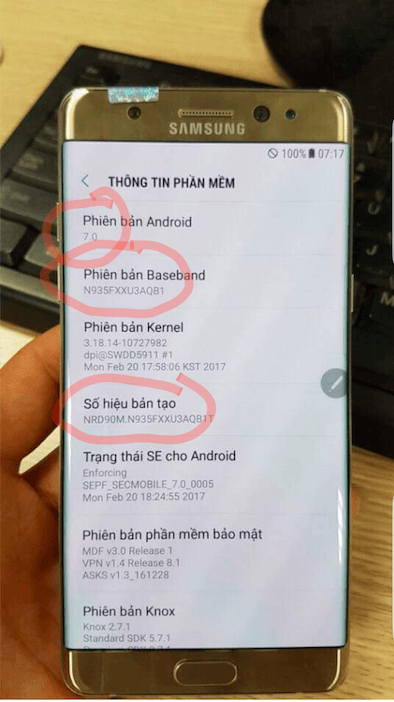 However, the phone in the image has SM-935, which means that the phone will be exclusive to Vietnam market, as expected earlier. Another important data spotted in the picture is the battery capacity of the phone. Yes, as you can see in the image above the battery capacity is clearly shown as 3200mAh battery, which is also in-line with the previous leaks. Earlier rumors suggested that Samsung will embed a 3000mAh to 3200mAh battery in the refurbished Note 7 and finally, they have decided to keep it at 3200mAh. Moreover, the phone will run Android 7.0 Nougat out-of-the-box this time around, which is very much expected. Also, it is not easy for the South Korean giant to bring back a discontinued phone that caught fire on several occasions. Nevertheless, Samsung, this time will conduct rigorous quality checks for the product before coming out with a final version. The Samsung Galaxy Note 7, just after the launch was touted as the best smartphone of 2016, but soon started exploding that led the company to pull it back. A Recent report claimed that Samsung is planning to release the phone sometime in June or early July. Also, the refurbished Note 7 might cost just three to five percent less than the original price of Note 7. What do you think of Galaxy Note 7 with a smaller 3200mAh battery? Will you get one? Let us know in the comments section below. I’d buy it if the price comes around 40k. If nobody buys the thing in India, then Samsung will lower the prices in a month or two. But it also depends on the performance of the One Plus 5 and Mi6 against the Note7.